Do Your Gutters, Soffits or Fascia Need To Be Repaired? Your gutters, soffits and fascia boards all play an important functional role in how your home deals with the elements. Gutters help channel away water from your foundation, soffits allow your roof to breath more efficently and fascia boards help protect and give everything a nice fit and finish. What do you do when any your gutters, soffits or fascia board needs repair? You call L.I.K. Gutters. L.I.K. Seamless Gutter Co. Inc. is a full service gutter contractor based out of both Suffern and Monroe, New York. We specialize in the repair and replacement of gutters, soffits and fascia cladding. From repairing a small section of gutter, to rehanging your gutters to installing new soffits and fascias our small team of dedicated craftsman will be able to help you. Over many years of service (or much sooner with a poor installation) your gutters will begin to look worn out. They may pull away from the roof edge, become warped, bent and no longer functioning at their best. We can replace gutter hanging systems, broken section of gutters from wind or storm damage and more. 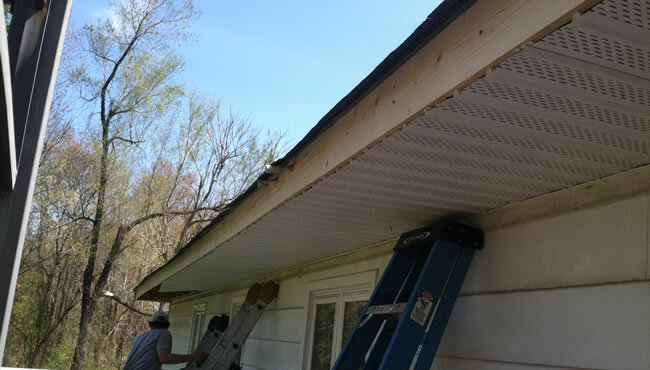 Soffits can be damaged a number of ways, most often it’s storm or ice dam damage that has occurred or maybe it’s just time to replace those old wooden soffits. New vinyl soffit will provide better roof ventilation which can help with a variety of roofing issues including ice dams which can be a real problem in our neck of the country. Fascia board may require periodic repair or replacement as it ages and becomes warped or pulls away from the roof. These boards can be particularly vulnerable to water damage when it gets in behind the fascia and causes rot and other roofing problems. When your fascia boards appear to be rotten or they are pulling away from your home they should really be replaced. Soffit and fascia also come in many colors that in most cases can match your new gutter system perfectly. New soffit and fascia is affordable and eliminates the need to paint ever again. Why Choose L.I.K. Seamless Gutter Co. To Repair Your Gutters? When you choose L.I.K. 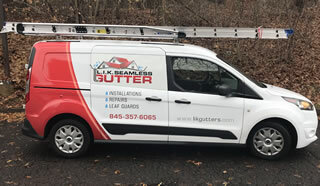 Seamless Gutter Co. to repair gutters, soffits or fascia boards on your home you are partnering with a local family run business that has being successfully operating in the New York and New Jersey area for over 40 years. Now being run by the 2nd generation, the Vasilik brothers are true craftsman who put great thought and care into every single gutter system we install for our customers. You can count on receiving a quality product, installed by a small and dedicated team of craftsman who will leave nothing behind but what we’ve promised you. Your replacement gutters, soffits and fascia will carry a warranty and you’ll have the peace of mind knowing that we’re going to be around to service it should you ever need us again. If you’d like to request an estimate to have gutters, soffits or fascia boards repaired or replaced on your home please give us a call or fill out our contact form and someone will be getting right back to you.